Hooray! Japan is not in a recession. 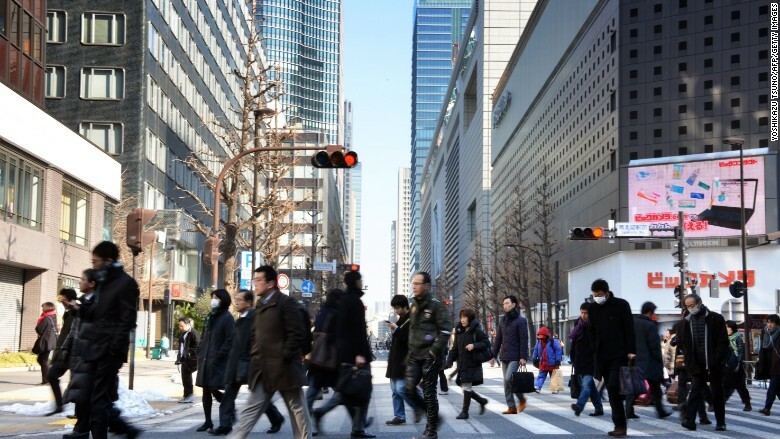 Gross domestic product grew by an annualized 1% in the third quarter, instead of contracting by 0.8% as previously announced, Japan's Cabinet Office said Tuesday. That means the world's third-largest economy is not in recession, which is commonly defined as two consecutive quarters of economic contraction. Japan's GDP data is often revised, because initial estimates are based on partial survey data. But Tuesday's shift from negative to positive growth is an unusually large change. Despite the good news, the benchmark Nikkei fell around 1% on Tuesday. Still, the revised numbers should give Prime Minister Shinzo Abe some fuel to continue championing his plan to boost the economy. Known as "Abenomics," the strategy involves a massive bond-buying campaign, coupled with structural reforms and stimulus from the central government. The idea is that the combined measures would end years of deflation, and put Japan on a path to sustained growth, but critics have been quick to point out that Abe's plan hasn't dramatically changed the economy. Experts were before betting that the central bank would be pressured to unleash more stimulus, but the government kept holding back. Now, calls for action are starting to wane given the revised growth figures. "Looking ahead, upbeat business surveys and a rebound in industrial production suggest that economic activity will continue to recover this quarter," wrote Marcel Thieliant of Capital Economics in a research note. "With underlying inflation still strong, the Bank of Japan will likely leave policy settings unchanged at its January meeting."